“Fires on the Plain” is based on a novel by Shohei Ooka, previously adapted in the 1959 film of the same name by Ken Ichikawa. The film begins with Shinya Tsukamoto’s character, the soldier Tamura, being sent back and forth to a field hospital to treat his tuberculosis that is causing him fits of coughing. His commander doesn’t want him in the squad in this state, and the medical teams tell him he is not unwell enough to be treated there. Tamura’s company have been sent to an island in the Philipines, where they are currently languishing without supplies, surrounded on all sides by dense jungle. After an attack by American forces destroys their make-shift hospital and fighting kills off most of Tamura’s fellow soldiers, he is left wandering around trying to survive in this hostile environment. 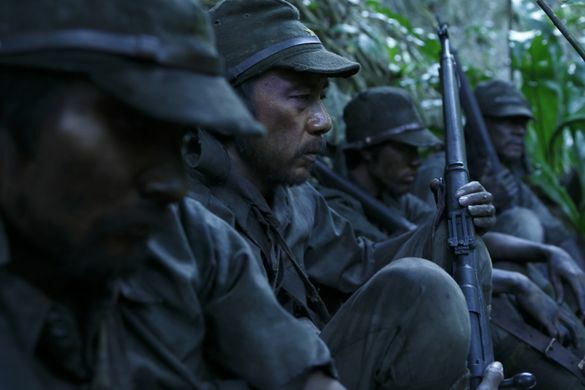 Shinya Tsukamoto’s “Fires on the Plain” is a look at the brutal and dehumanising nature of war. The film throws you straight into the action with little explanation of where they are or what they are doing. The early parts of the film are characterized by information being filtered through a mass of almost distracting editing and visuals that give the impression of being lost in this world along with Tamura, unable to escape. You are able to piece together where they are and why, but the film is less focussed on the specifics of the war, and more on a contemplation of war in general and what it can do to an individual. Tsukamoto’s direction is perfect for this purpose as he is willing to sacrifice clarity for a more vague sense of feeling or theme. The actors, Tsukamoto in the lead, with Lily Frankie and Tatsuya Nakamura in supporting roles, all do a great job at capturing the desperation of these men. In a tough situation they are stripped down to the barest desire to survive. The cinematography shows a great variety of styles, from the claustrophobic jungle, shaky-cam footage, to spectacular sunsets, and a bravura sequence of the meat-grinder battle sequence. Chu Ishikawa’s score shows the same inspired creativity. It opens with the ominous beat and wailing sounds, almost a dirge-like chorus, that soon transforms into a haunting requiem for their loss of innocence. “Fires on the Plain” takes place almost entirely in the same jungle location so there is the sense of inescapability, without the respite of a cutaway or a flashback, only the interminable suffering of the characters. The film is focussed on the horrors of war and a man confronting his absolute limit in terms of what he is willing to do to survive. Following the destruction of most of their party, with men suffering from starvation and the slow madness that accompanies the stress of war. The finale of the film is a heartbreaking moment. For the first time letting us escape the hell of the battlefield, it gives us one last warning that the scars of war will never leave those who fight. The film’s anti-war message is brought home powerfully in this scene. It is shown throughout that there is no glory in war, these men are stripped of their civility and made to confront their base atavistic nature.